This memoir is written by a woman who worked for IBM as a PR writer at Cape Kennedy during 7 moon landings during the 60’s and 70’s. She worked her way up from her starting job as a secretary and was a divorced mom raising three daughters. She was a working mom when all the mothers of her daughters’ friends were stay-at-home moms. There were few women working at Cape Kennedy, with a ratio of 400 men to 1 woman. The divorce rate was high and adultery was common. I really did expect to like this book a lot more than I did. I well remember the excitement and thrill of the space launchings and found it all to be so fascinating. Since the blurb of the book said that reading this book would give you a front row seat by someone who lived through it all, I was disappointed in the scientific information contained. The space station work was mostly told in a tour-guide fashion and was mostly facts, such as the complete Apollo team consisted of over 400,000 people. I didn’t feel any of the excitement that I felt back in the 60’s. The book ends before the most exciting flight of them all – Apollo 11. In all fairness to the author, I do admire her determination to become a writer and I’m sure the PR work she did at Cape Kennedy was important. Unfortunately, I soon tired of reading about her legs and her miniskirts and her makeup and her flirting with astronauts and her affairs. 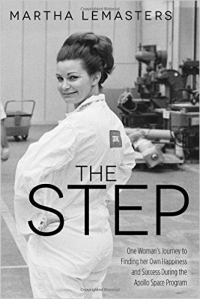 There’s one scene in the book where she flaunts the rules about not wearing a miniskirt on the catwalks, which rule was due to the fear that the distraction would cause men to either fall off of the not-very-secure catwalks or drop a tool that would kill someone, all done in the name of getting some photos of astronauts. I didn’t see this as a silly rule and I thought it was a very foolish thing for her to do and her action only lessened my admiration of her. I won this book in a contest given by the author with the understanding that I would give an honest review.